An action potential (AP) is the mode through which a neuron transports electrical signals. It is defined as a brief change in the voltage across the membrane due to the flow of certain ions into and out of the neuron. In this article we will discuss how an action potential is generated and how conduction of an action potential occurs. The resting membrane potential of cells varies depending on the cell type, the resting potential for neurons typically sits between -50 and -75mV. This value depends on the types of ion channels that are open and the concentrations of different ions in the intracellular and extracellular fluids. In neurons K+ and organic anions are typically found at a higher concentration within the cell than outside, whereas Na+ and Cl- are typically found in higher concentrations outside the cell. This difference in concentrations provide a concentration gradient for ions to flow down when their channels are open. At rest, most neurons are permeable to K+, Na+ and Cl-, as such they will all readily flow down their concentration gradients, with K+ moving out of the cells and Na+ and Cl- moving in to the cell. However the cell is most permeable to K+, as such this exerts the greatest influence on the resting membrane potential – and the value is closest to the equilibrium potential of K+ (the membrane potential at which the concentration gradient for an ion is balanced) out of the three ions. These concentration gradients are maintained by the action of the Na+/K+ ATPase via active transport, which in turn allows the membrane potential to be maintained. Fig 1 – Diagram demonstrating the ions involved in setting the resting membrane potential, as well as the direction of the ion concentration gradients. During the resting state the membrane potential arises because the membrane is selectively permeable to K+. An action potential begins at the axon hillock as a result of depolarisation. During depolarisation voltage gated sodium ion channels open due to an electrical stimulus. As the sodium rushes back into the cell the positive sodium ions raise the charge inside the cell from negative to positive. If a threshold is reached, then an action potential is produced. 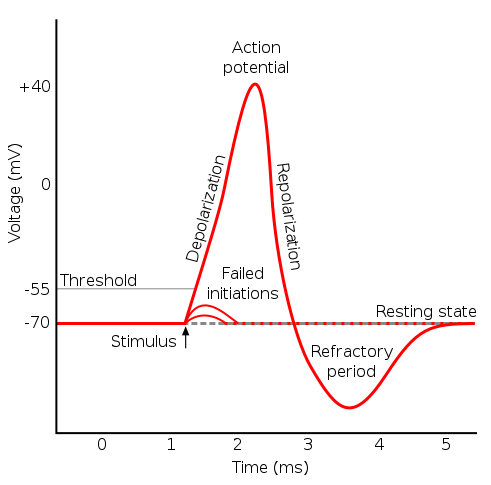 Action potentials will only occur if a threshold is reached, as such they are described as “all or nothing“. If the threshold is reached then the maximum response will be elicited. Once the cell has been depolarised the voltage gated sodium ion channels close. 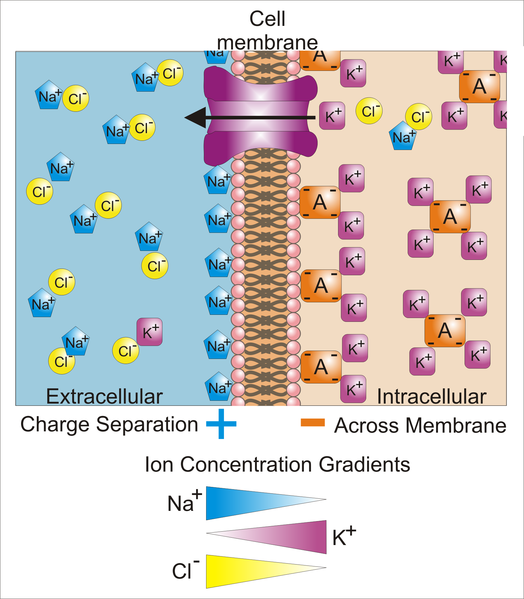 The raised positive charge inside the cell causes potassium channels to open, K+ ions now move down their electrochemical gradient out of the cell. As the K+ moves out of the cell the membrane potential falls and starts to approach the resting potential. Typically, repolarisation overshoots the resting membrane potential, making the membrane potential more negative. This is known as hyperpolarisation. It is important to note that the Na+/K+ ATPase is not involved in the repolarisation process following an action potential. Every action potential is followed by a refractory period. This period can be further divided into the absolute refractory period and the relative refractory period. This period occurs as once the sodium channels close after an AP, they enter an inactive state during which they cannot be reopened regardless of the membrane potential. This is known as the absolute refractory period. Slowly the sodium channels come out of inactivation. This is known as the relative refractory period. During this period the neuron can be excited with stimuli stronger than one normally needed to initial an AP. Early on in the relative refractory period the strength of the stimulus required is very high and gradually it becomes smaller throughout the relative refractory period as more sodium channels recover from inactivation. Fig 2 – Diagram showing the phases of an action potential in relation to the membrane voltage over time. Action potentials are propagated along the axons of neurons via local currents. Local current flow following depolarisation results in depolarisation of the adjacent axonal membrane and where this reaches threshold, further action potentials are generated. The areas of membrane that have recently depolarised will not depolarise again due to the refractory period – meaning that the action potential will only travel in one direction. Fig 3 – Animation to show how an action potential is propagated along an axon. In order to allow rapid conduction of electrical signals through a neuron and make them more energy efficient certain neuronal axons are covered by a myelin sheath. The myelin sheath surrounds the axon to form an insulating layer. Further information on the myelin sheath can be found here. Myelination improves conduction by increasing the membrane resistance and decreasing the membrane capacitance. There are periodic gaps along a myelinate axon where there is no myelin and the axonal membrane is exposed. This gaps are called Nodes of Ranvier. Myelinated sections of the axon lack voltage gated ion channels where as there is a high density of ion channels in the Nodes of Ranvier. For this reason, action potential can only occur at the nodes. The myelin sheath acts as good insulator so the action potential is able to propagate along the neurone at a higher rate than would be possible in unmyelinated neurons. The electrical signals are rapidly conducted from one node to the next, where is causes depolarisation of the membrane above the threshold and initiates another action potential which is conducted to the next node. In this manner an action potential is rapidly conducted down a neuron. This is known as saltatory conduction. 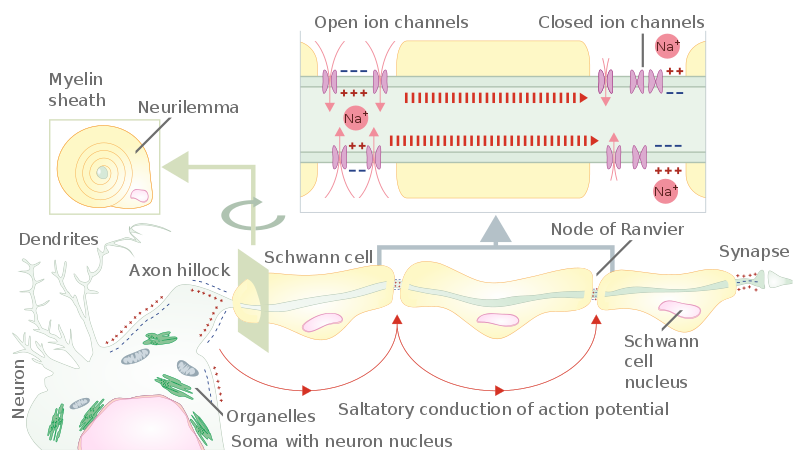 Fig 4 – Diagram to show how the myelin sheath results in saltatory conduction of an action potential along an axon. Multiple sclerosis (MS) is an acquired, chronic autoimmune disorder affecting the CNS. It results in demyelination, gliosis and neuronal damage. Common presentations of the disease are optic neuritis, transverse myelitis and cerebellar related symptoms such as ataxia. 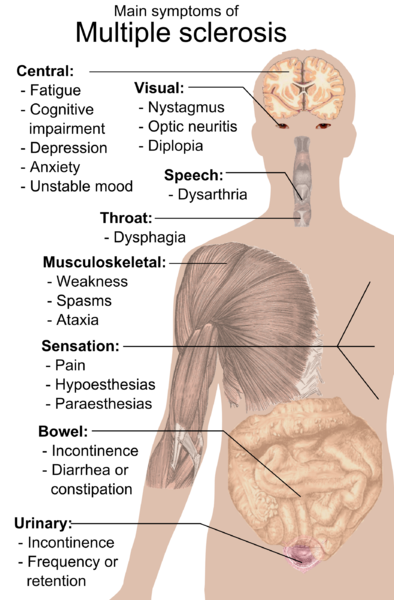 Fig 5 – Diagram demonstrating the main symptoms that multiple sclerosis may present with. Relapsing-remitting – Patients face episodes of remission (during which no symptoms are present) and exacerbations of the disease. Secondary Progressive – Initially the MS is of relapsing-remitting pattern however at some point the disease course changes and the neurological function gradually worsens. Primary progressive – After onset of disease there is steady progression and worsening of the disease. There is no known cure for MS however some therapies have proven useful in terms of managing acute exacerbations, preventing exacerbations and preventing disability. For example, high dose IV corticosteroids can help to relieve symptoms in acute exacerbations.